Richard Sherman is loud. He’s loud even when he’s not jacked after a physical game in which he made the play that saved the Seahawks’ season and sent them to the Super Bowl. He’s loud even when he’s not screaming at Michael Crabtree by way of Erin Andrews on national television. His voice projects very well. It’s a nice voice. He knows how to enunciate to make a point. A lot of people think that Sherman should quiet his yawp and just play. Those who aren’t saying vile things about him, and those who aren’t out to have him branded as a menace to society, say it more sadly. They say it’s a shame, because we should be talking about what he did on the field. Fine, let’s — I’m happy to. Because it was spectacular. It was a display of physical genius: his timing and his body control, and the height at which he soared, his long arm extended like a tentacle. The guts of it, with the game on the line, the wherewithal to make the play in such a way that gave his teammate Malcolm Smith a chance to make the interception — exactly the tipped ball he says he practices. Sherman isn’t allowed to just play, of course. He is required, by contract, to talk. And by custom, he’s supposed to speak without saying anything that might upset anyone. But Sherman is not just an athlete, freakishly built and exquisitely programmed. He is also a human being, with a voice, and he happens to like using it. When asked questions, he will answer. Was he surprised that Kaepernick targeted him after avoiding him all night? “I think everyone in the stadium was surprised,” Sherman answered. Ah yes, the choke — unsportsmanlike conduct. Sportsman used to be a name for a particular breed of man, a cross between a human and an athlete. It’s one of those words, like amateur, that has become essentially meaningless — if it ever really meant what it was supposed to say. Be gracious. Be humble in victory. Honor your enemy. Let your actions speak louder than words. Richard Sherman is not gracious. He is not humble. He makes a lot of noise, and some of it is football noise: angry and reckless and careless and undifferentiated. If I were Erin Andrews, I’d probably want an apology. 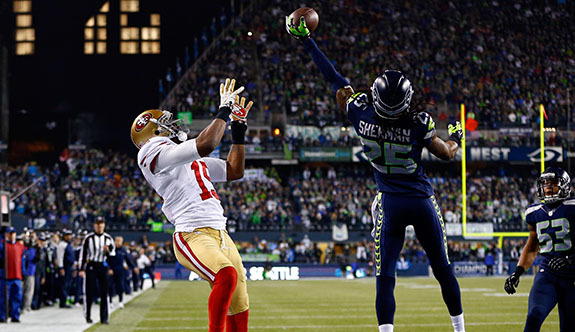 But if I were a Seahawk, I’d probably want to run through a wall for Richard Sherman. At the podium, his dreads were pulled back and he wore a floppy bow tie. In a suit, his cephalopod arms had almost human proportions. He looked natty. He looked happy. He flashed a smile. He kept talking. I could have listened to him all day. Jermaine Kearse stood outside his locker after the game, shifting back and forth on his feet. He looked like a man trying to answer dumb questions1 by trying to remember his dumb scripted lines. Kearse is not usually surrounded by reporters thrusting recorders and boom mikes in his face. He joined the Seahawks as an undrafted free agent. At the start of last season, he was cut from the practice squad. His voice was soft and endlessly patient. It’s an amazing feeling … Russell threw a great ball … Try to make the most out of every opportunity … Just take it one day at a time … Most athletes are trained by institutions, by example, or by harsh experience to speak without saying anything. Or they’re asked questions they can’t adequately answer: How did you feel (shock); what were you thinking (catch the ball). So we talk for them. We make their noise. We shout. We break them down. There is a lot of noise in football, and most of the noise says nothing. It is electric guitars in the television lead-in, jet plane roars, industrial sounds meant to signify manly manhoodness. It is loud suits, shouts of “Omaha!,” the groan and crunch of large men crashing into each other. It is Jim Harbaugh throwing temper tantrums and screaming and acting like a parody of a 3-year-old, for which he is considered to have a lot of passion for the game, because “passion” is apparently another word for noise. You hear a lot about passion and noise in Seattle. It’s inescapable. Even if it didn’t hit your eardrums and settle in your jaw, even if it didn’t make the floor shake, it would be impossible to avoid, because no one would stop talking about it. It was everywhere and endless, like the small grit of rain in the concrete sky. It came from spotted owl activists and the loggers who lost their jobs because of spotted owls. There were punks with safety pins stuck in their skin; dads in Eddie Bauer; girls wearing suede wedges and Earl Thomas jerseys; Starbucks baristas; and the artist who graced my Facebook page with a close-up of his Beast Mode grill. Maybe it had something to do with being rooted on the margin of the country, caught between mountains and water. Maybe it had something to do with being the spiritual home of both grunge and tall lattes, counterculture and mass culture. In the corner of the press box at CenturyLink Field, a barista calmly steamed milk for grande mochas while the stadium shook. Maybe it went deeper, back to the late 1970s, when the city was mired in depression, reeling from cutbacks at Boeing, unemployment around 12 percent. A billboard by Sea-Tac Airport read, “Will the Last Person Leaving SEATTLE — Turn Out the Lights?” That’s when the city got a football team to cheer for (and to pay for; years after the Kingdome was demolished, the city is still paying down its debt). The team was terrible for a long time and nearly left town. But then the Sonics did leave, and the Mariners sucked, and football — football was what it is in America. It was Sunday and beer and screaming; it was marine blue and gray-moss green; it was savagery and community and a hell of a lot of fun. It was for guys who worked in airplane factories and who programmed PCs, transplants in a city where it can be so hard to make friends that there’s a phrase for it, the Seattle Freeze. Everyone could be the 12th Man. Winning, which Seattle started to do, no doubt had a lot to do with it. But not everything. Even the excitement when the Seahawks made the Super Bowl in 2005 doesn’t match what it is now, a friend who’s a huge Hawks fan told me. “The craziness surrounding the Seahawks is like the city’s collective id exploding,” he said. And it turned out that the city’s deepest driving desire was to make a really, really big noise. Especially against San Francisco. Not that the opponent on the field totally matters — Seahawks fans, after all, made noise against the Saints just to be more noisy than the fans in Kansas City. Still, it probably helped that it was San Francisco, with its gold rush and golden hills, its golden light on the Golden Gate Bridge and its long history of golden quarterbacks in golden pants. San Francisco, with its iPhones and iPads and Google doodle, and its claims to the creative spirit, as if an Apple Store didn’t have the vibe of a totalitarian state with good Wi-Fi. Add in the hatred between the teams. Plus, the noise was effective. It upset snap counts and rattled opponents. And it made the game, which seems ever more packaged and remote, made for TV money, seem like it was theirs. There was a moment when the crowd was nearly silent, when it seemed like maybe this football thing was not something it wanted to be part of after all. It was the moment when NaVorro Bowman’s leg snapped like a stick. On the monitors overhead, Fox showed the replay of his leg bending over and over, trying to tease out who had possession of the ball. In the stadium, the atmosphere was muted. There were reports that some fans threw food at Bowman as he was carted off — but the rest of the stadium was somber and edgy. Then came the thrilling end of the game, and the press box started shaking again. It was relief venting, amnesia settling into its place. It was the noise that took the place of talk — because real talk would have had to account for what had happened, a gruesome injury to a young man who plays a brutal sport. There are different ways of saying things. There’s Marshawn Lynch’s way, which is to stay silent and run like a force, to move with imperturbable balance, footwork you can’t dream up. He is like sound itself; it seems like he could generate it just by the force in his step. In that, he’s totally unlike Colin Kaepernick, who runs with a lightness and an easiness, all instinct for space, that makes you catch your breath. Lynch tried to stay quiet off the field. Let your actions do the talking. He was fined $50,000 by the league. Richard Sherman makes a lot of noise, and some of the noise is football noise. But he seems like the city that he plays for — contradictory, intelligent, interesting, arrogant, and loyal. He is different. He is a teammate, and a leader and a supporter of his teammates. He’s also a pirate. I’d want to be onboard his pirate ship.